French President Francois Hollande has revived calls for a 75% top income tax rate. If at first you don't succeed in taxing the rich, try, try again. French President Francois Hollande made changes to his failed proposal for a 75% top tax rate on Thursday, shifting the burden of payment from individuals to businesses that pay salaries over 1 million euros. Hollande, during last year's presidential campaign, proposed a 75% tax rate on individual income above 1 million euros. The controversial tax was rejected by France's judiciary. 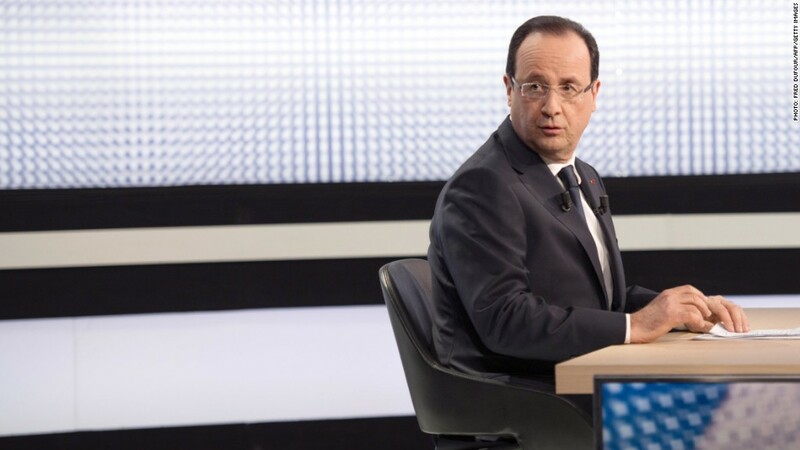 Hollande made his new payroll tax proposal on big salaries during a late-night television broadcast. "The Constitutional Council made a decision," Hollande said. "I respect it. So, I'm going to take a different path." Hollande said the measure is needed to ensure transparency at large corporations -- the only businesses that can afford to pay employees so generously. His initial proposal, which never became law, inspired French actor Gerard Depardieu to abandon the country, instead adopting Russian citizenship and moving to Belgium. Depardieu is a cultural icon in France, and his departure triggered a hailstorm of public comment for and against him. In the United States, Democrats have also made the argument that the rich should pay higher taxes as a matter of fairness. As part of the fiscal cliff deal at the start of this year, the top marginal rate on income was allowed to revert to its pre-2001 level of 39.6%. Hollande's popularity has fallen dramatically in recent months, and the embattled president used the broadcast Thursday to press for more reforms. The French economy, second only in size to Germany in the 17-nation eurozone, has stagnated. Markit economist Jack Kennedy said last month that France's performance in the first quarter of 2013 was shaping up to be the worst since 2009. "The broad-based weakness across manufacturing and services leaves scant room for optimism, with a range of indicators from new orders, backlogs, employment and output prices all residing at depressed levels," he said. Germany, by contrast, saw a further improvement in business activity in February for a third month running, although the pace of expansion slowed slightly. Markit said the gap in performance between the eurozone's leading economies was at its widest since surveys began in 1998. France was beginning to look like it belonged to the group of economies on the eurozone periphery, rather than the core, it said.